Posted on Fri, Oct 8, 2010 : 10:09 a.m.
A team of University of Michigan students will leave Saturday for Australia with a bunch of robots to compete in an international contest. The six students form U-M’s MAGIC team. MAGIC stands for Multi Autonomous Ground-robotic International Challenge, organized by the defense departments of the United States and Australia. Its goal is to demonstrate emerging unmanned technologies. It was open to academic and industry participants. Team Michigan is one of six finalists that will vie for $1.1 million in prize money. 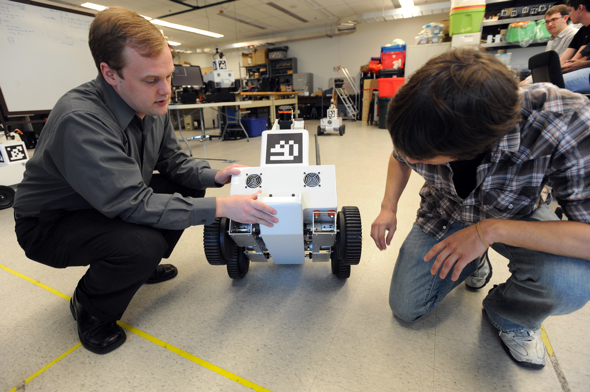 “Our robots may be simple looking, but their intelligence sets them apart. They can sense the world and understand what they’re seeing,” Edwin Olson, an assistant professor in the Department of Electrical Engineering and Computer Science who advises the team, said in a press release. University of Michigan robotics team member Mihai Bulic shows the inside of one of the 24 robots they designed and built for competition. The students on the MAGIC team started designing and building their machines more than a year ago, the university said in a press release. “We have mechanically beautiful machines thanks to help from about 30 undergraduates. We built custom circuit boards and electrical systems and our own sensor system. We’re using a camera and 3-D laser range finder, an inertial measurement unit, and our own wireless routing software,” Olson said in the release. In July, team members learned they had qualified for the finals, based on a site visit from contest organizers. At the contest, they’ll field about 14 robots. Their tasks will be to efficiently generate a map of the terrain and neutralize any bombs or enemy combatants without harming nearby civilians in a 500-by-500-meter arena. They’ll have about 3.5 hours to complete three phases. Each of the six teams will run on a different day of the competition week, and the winner won’t be announced until Nov. 22. First place wins $750,000 in research funding. David Jesse covers higher education for AnnArbor.com. He can be reached at davidjesse@annarbor.com or at 734-623-2534. Fri, Oct 8, 2010 : 7:05 p.m.
Fri, Oct 8, 2010 : 6:53 p.m. If these robots could find my keys that would be great. Fri, Oct 8, 2010 : 6:44 p.m.
"Their tasks will be to efficiently generate a map of the terrain and neutralize any bombs or enemy combatants without harming nearby civilians in a 500-by-500-meter arena." Isaac Asimov comes to mind. This is the next logical step to support the current drone war seeing operational duty in the Middle East. Just make sure these things can locate, tag and/or destroy IED's. IED's make up the largest percentage of coalition forces KIA. Fri, Oct 8, 2010 : 3:46 p.m.
Let's just hope they don't become self aware. Fri, Oct 8, 2010 : 1 p.m.
Good times. Go guys, go! Johnny 5, is alive! Or as they say in Australia: Johnny 5, is alive, mate! Fri, Oct 8, 2010 : 11:51 a.m.
Wow, Australia and $1.1 million in prize money? Good luck!